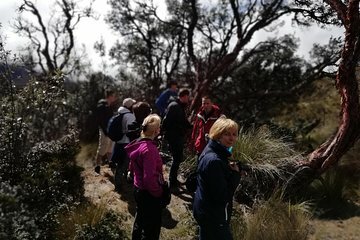 Breng een hele dag door op het UNESCO-beschermde nationale park Cajas tijdens een privétour. Sla de verwarring en onregelmatige planningen van het openbaar vervoer over bij het ophalen en inleveren van privé-hotels. Met een privégids aan je zijde hoef je alleen maar te genieten van het avontuur. Uw twee wandelingen op verschillende hoogteniveaus bieden een spectaculair uitzicht. Onderweg stop je voor de lunch in een lokaal restaurant. We had a wonderful day at Cajas Nationsl Park! Wilson was a very knowledgeable guide. Bring water and a snack! Would definitely recommend! Lunch was good in a traditional restaurant. Milton was great and attentive to our inability to climb fast due to the high altitude. The two hikes were very educational and the scenery was breathtaking. The tour was absolutely amazing. Our tour guide Eddy provided a very personal and educational experience. He was incredibly knowledgable about the flora and fauna of the park and always had something interesting to discuss, whether it had been the park's history, the ecology of the park and even the city of Cuenca and the people of Ecuador. He also took us to a great local eatery where we had some very authentic cuisine. He also walked at a very manageable pace. It was quite a long set of hikes, but he was understanding of us being unaccustomed to the high-altidue and didn't rush us through at any point. Honestly, we can't say enough good things about Eddy. It was apparent that he really loved what he did and he made for a most enjoyable day in Ecuador. We had an excellent and very knowledgeable guide. I would recommend that you go prepared with several layers because the weather can change and it can get very cold and windy. Also, take your own water and a snack i.e. a candy bar. We needed to stop to get water before driving out of the city. It's a beautiful area and this one day trip is a great way to get out of the city and see some of the countryside. Not particularly strenuous. Beautiful tour. Our tour guide, Milton, was phenomenal and very well educated in the flora and fauna of the area. We were taken to three different areas of the park, lowest, highest, and middle elevations. For the middle elevation, we were offered two choices: hard/technical and medium difficulties. Given the recent rains, we opted for the medium difficulty. It was perfect. For the non-vegetarians, my wife loved her lunch options. I was excited to hear about the vegetarian option until I saw it it was fried rice with chicken and hotdogs. Thankfully, the wife and I brought extra energy bars, so I had one of those to hold me over until I could visit a restaurant. This is the only reason I'm knocking a star off. We saw stunning scenery on this day hike. Eddie, our guide was extremely knowledgeable and set a good pace, with stops to point out and teach us about the geography, flora and fauna. We enjoyed the lunch at the mountain restaurant as well. Milton was an excellent guide and very knowledgeable about everything, flora and fauna. As it happened, I was the only participant, so I really could ask him a lot of questions. A great day.